This week the Church celebrates the winter Ember Days. We discussed Ember Days in September, and I won’t repeat myself now, but in short, these are the days the Church uses to consecrate the next natural season. In other words, this week the Church celebrates the beginning of winter. Today we’ll look briefly at three images the Church identifies with winter. 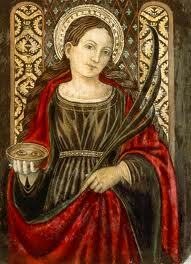 St. Lucy makes a good patroness of winter. She’s one of the standard virgin martyrs of the early Church: like all the rest, the short version of her story is that she consecrated her virginity to Christ; but the Romans didn’t like people living beyond this world, so they killed her. The standard iconographic symbol of Lucy shows that her eyes were gouged out. This may not be historically accurate, but even if it is a later invention, it points to a deeper intuition about how St. Lucy’s serves as a patroness of winter – and, perhaps, why the Church gave her this day for her feast day. 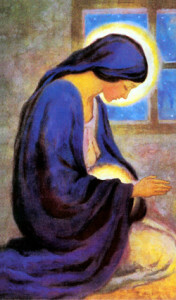 Her name, Lucia, means light, but the Church celebrates her at the beginning of winter. Lucy reminds us that the true light shines in the midst of darkness, the truest sight where our physical eyes cannot see. Thus St. Lucy calls us to see the darkness and desolation of winter as a sign of how, in this world, the truest light is faith, not sight; the truest sight sees God where the world sees emptiness. 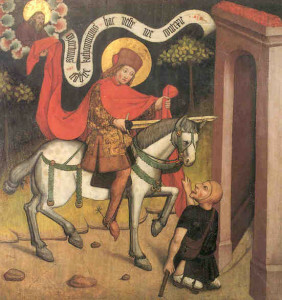 Another patron saint of winter is St. Martin of Tours. His feast day, Nov. 11, marks a transition from Autumn to Winter. Traditionally, it was the time of the Fall harvest, and so a harvest festival. But also the marker that the growing season had come to the close, and the time of winter scarceness was come. Thus it used also to be the beginning of one of the two great fasts, a kind of Lent that preceded Christmas. It’s nice to notice the natural rhythm here. The Church embraces and sanctifies the rhythms of nature. In traditional societies, winter was a time of scarceness: so you have a few days and periods of celebration scattered here and there, to promise that we will survive the winter. But also fasts that were really quite necessary: there’s no food, so we might as well treat it as a spiritual discipline. The second winter fast, Lent, looks forward to when things finally start growing again. 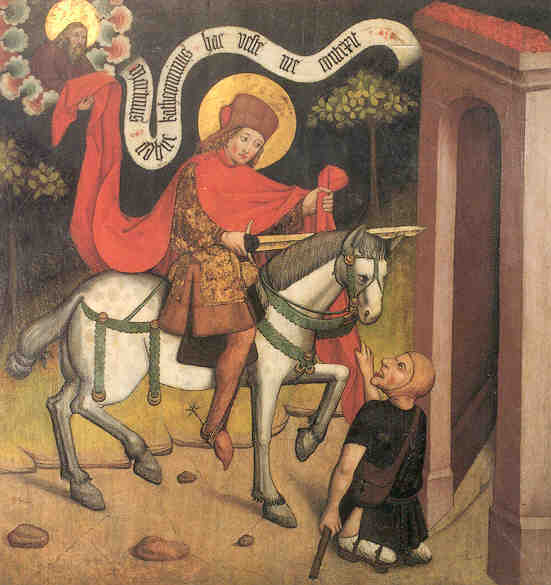 St. Martin is a great saint, very popular during the Middle Ages. He was a soldier who converted, became a monk, then a very popular figure of sanctity – and then was made a bishop. He was a model bishop, travelling around to evangelize the countryside. But the favorite story, the story that won him the name “Martin the Merciful,” is that one night as he was entering a town, he saw a shivering beggar standing outside, and gave him his own cloak. Jesus later appeared to him and proclaimed that he himself had been the beggar. Catholicism has always taken seriously Matthew 25: I was naked, and you clothed me. As a patron saint of winter, Martin the Merciful reminds us to see in winter the neediness of those who still go without food and shelter. The desolation of winter reminds us of the true obligation of Christian charity. When we are cold, we think of those who are truly cold. Finally, of course, the Church marks winter with Advent. In short, a time of waiting. Advent, of course, has a double orientation. In the immediate future, we look forward to Christmas, and our waiting for Christmas gives immediate meaning to the season. But more distantly, we look forward to Christ’s final coming. In a way, Advent is a deeper marker of winter than is Christmas: in a sense, Christmas serves Advent more than vice versa. Advent reminds us that this world is a kind of winter – but that Spring will come. As our third “patron” of winter, Advent reminds us never to settle for winter, but always to look forward to the Spring of Christ’s coming. Lucy, the true light that shines in the darkness; Martin, clother of beggars; Advent, the season of waiting. In the Church’s calendar, winter becomes a season pregnant with meaning. But enough of my fancy words. How do you experience the spirituality of winter? What do our southern hemisphere brothers and sisters in Christ do about these “winter” feast days? Great question. Gosh. Cardinal Ratzinger actually has a section on this in his section on liturgical time in The Spirit of the Liturgy. He has nice things about the parallels between the Jewish Spring and Fall liturgies, each of which speaks of death and rebirth. But his point isn’t the same as mine — he wants to talk about how salvation is written on the cosmos, whereas I’m talking about how we read it out, kind of the opposite direction — and he doesn’t go into as many specifics as I do. There are some interesting parallels between the desolation of winter and the desertification of summer – especially, I think (I say kind of ignorantly) in much of the Southern hemisphere, none of which has exactly Minnesotan winters. And then, of course, there are funny ways that Lucia, she of the light and the true sight, also works as a summer saint. And we can learn from each other’s devotions, even if they don’t apply the same in our hemisphere. Harvest might not be at the same time, but you can still appreciate how others sanctify the harvest. Nonetheless, gosh, there’s something to be said, I think, for inculturated liturgy. That, in fact, is the real Vatican decision on Ember Days. These days, every time options are given, we take the option not to do it. But what the real legislation says is that the celebration of Ember Days should be adapted to the realities of different places. Winter Ember Days, for example, should maybe be in June in the Southern Hemisphere.